Pancakes! Photo by Donna Turner Ruhlman. I love pancakes on winter mornings. And I find something terribly satisfying about pancakes with an over-easy egg and bacon—the savory bacon and the sweet pancake and syrup expertly mediated by the versatile egg. I got to thinking about them recently after a commenter on a recent post announcing the Ratio 2.0 release wrote that for five bucks he’d do the math himself. It kind of annoyed me, but I couldn’t figure out why until I thought about pancakes. I always remember that I prefer a 5% brine, so that however much water I use, I can multiply that by .05 to determine the salt quantity. But ratios aren’t simply math, they’re about the proportions of several ingredients. No matter how many times I make pancakes, I always check the ratio. Moreover, they scale to what you have or need. Say you have only one egg. Say you wake up to find 13 of the guests who came to your Super Bowl party last night are asleep in your living room and will need to be fed. What to do?! Ratios are the key. And what’s best is that if you know the ratio, you know infinite variations. You can make these pancakes savory or sweet or put them to different uses. This all-purpose batter will make great fritters if you use it simply as a binder, for example. The following ratio and recipe is from my book Ratio: The Simple Codes Behind the Craft of Everyday Cooking. What I like about a pancake ratio is that you can tailor the amount according to how many people you want to feed, even if you just want to feed yourself. Also, you can vary it to your own taste, adding more or less liquid for thinner or thicker pancakes. Buttermilk or homemade yogurt can be measured as half the liquid for a more complex flavor. You can also replace 25 percent of the flour with cornmeal, whole-wheat flour, or other ground cereals or grains for differing flavors and textures. These are standard pancakes, flavored with a little sugar and vanilla. I like to cook them on a film of bacon fat, which gives them a crisp crust. Combine the wet ingredients in a bowl and whisk until they are thoroughly mixed. Combined the dry ingredients (press the baking powder through a strainer if it’s pebbly). Combine the wet and dry ingredients and whisk or stir just until the batter is smooth (don’t over mix or the pancakes can be tough). This ratio results in a fairly thick batter, and thick, cakey pancakes. If you like them thinner, add 1 or 2 ounces of milk. Cook on a lightly oiled griddle or pan over medium heat until done. My past posts on making mayo and the key to making flaky biscuits. Here are 10 different fillings for your pancakes. Want to learn more about this breakfast treat? 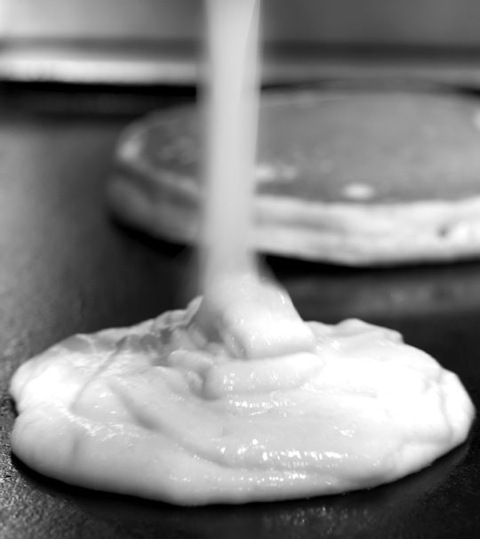 Check out the history of the pancake. Personality type can be determined by how you eat an egg. © 2014 Michael Ruhlman. Photo © 2014 Donna Turner Ruhlman. All rights reserved. You can actually replace the flour straight one-for-one with almond flour, and it works perfectly. I usually make them with almond flour and with almond milk as the liquid. i tried this last night, when making corn-cakes: subbed almond meal for the wheat flour. worked really well. and the little bits of almond went nicely with the slightly-chewy corn meal. put them under some chicken chipotle sausage. yum. I’ve used this ratio many times at the restaurants for staff meal and it works. However, I find there’s one very key technique missing from the instructions, and it’s to NOT OVERMIX the batter. I made this mistake the first few times I used this ratio, and the pancakes come out like lead. I also find baking powder is essential to getting a nice lift. Other than that, this is my go to ratio everytime. so true on the mixing! only mix to combine, otherwise too much gluten developed. Great post, I love breakfast for dinners, now I’m hungry. When you saw “five bucks,” you thought of buckwheat, a classic pancake ingredient. Depends on whether you think pancakes are the big flat cakey kind or the light, thin crepie kind … different ratios. It turns out to be a spectrum from too much flour to too little flour but almost everything in between can be really good in one circumstance or another. For five bucks, I’ll let you do the math. Wow, thanks for commenting, bail bonds of adams county! thrilled you took the time. what an honor. Aren’t iPhones great?! The mediator between pork and cake must be the egg. I like it. Very Fritz Lang. I’ve been making cornmeal and parmesan pancakes for breakfast recently–I really should throw an egg on top sometime! Matzo meal makes wonderful pancakes. Break two eggs into a bowl, pour enough matzo meal in to make a thick batter, thin it with a little milk, add salt and pepper, and fry them in hot oil. You can also add a blob of cottage cheese. I like the idea of using the recipe as a binder for a fritter. Thanks. So true about ratios and pancakes! For many years I’ve been making Daddy’s Pancakes every Saturday morning. My scalable recipe is: 1 egg, 1 oz butter, 1 cup milk, 1 cup flour, 1T sugar, 1t BP, 1t salt. Beat the egg(s), whip in melted butter to emulsify, mix in milk. Sift in dry ingredients, mix gently. To jack it up a notch, add 1 oz lemon juice to the milk, and add 1/4t baking soda to the dry ingredients. This makes really light, tall pancakes! Still the best damn pancake recipe ever. Never going back. This has been my go to recipe for years. On occasion I will do half milk and half OJ, which really works well. I had not eaten a pancake in years, but this post inspired me to get out the electric griddle and put my sourdough starter to use. Two batches in two weeks, with a third planned for tomorrow. So, for decades I’ve found and used a variety of pancake recipes trying to balance flavor, fluffiness and flatlessness… and the recipes I ended up keeping around the kitchen all use about 2 Tbls of oil per cup of flour. Why? I took their collective words for it, but have had Ratio since you published (terrific!) and haven’t thought about asking why others use oil in pancake batter, but not you, and many others… thanks! So, for decades I’ve found and used a variety of pancake recipes trying to balance flavor, fluffiness and flatlessness… and the recipes I ended up keeping around the kitchen all use about 2 Tbls of oil per cup of flour. Why? I took their collective words for it, but have had Ratio since you published (terrific!) and haven’t thought about asking why others use oil in pancake batter, but not you, and many others. I like the butter flavor better, but why is oil so prevalent?… thanks! previous to and you’re simply too magnificent. read much more from you. This is actually a great site.